Kitchen gift guide 2013: The knives, pans, and immersion blenders we can’t do without. The knives, pans, and immersion blenders we can’t do without. 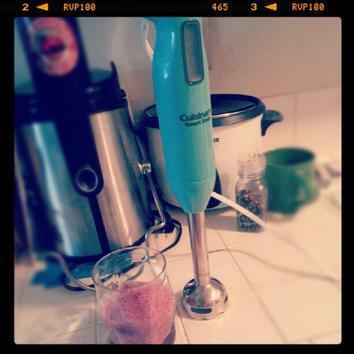 Immersion blender and berry smoothie. Buying a holiday present for a home cook seems like it should be easy: There are entire stores and catalogs devoted to stocking every piece of cooking equipment in existence. But no one wants to give an absurdly specific item that’s going to languish at the back of the cabinet—an ebelskiver pan, for instance, or a hot chocolate carafe. You want to give a gift that will actually be used. To help you in your quest for the useful culinary holiday present, Slate staffers offer their must-have kitchen items—the equipment we use on a weekly if not daily basis—listed here from most expensive to least. Rob Mifsud made the case for sous vide cooking, where vacuum-bagged food is warmed by a precisely temperature-controlled water bath, back in July. This ultimate “low and slow” cooking technique isn’t for every meal, but it’s a great weapon to have in the arsenal. The main problem, traditionally, has been cost. But while Mifsud was excited about Nomiku possibly lowering the price of entry to $359 (Update, Dec. 13, 2013: It was eventually priced at $300), Anova has already shattered that barrier with its brand new $205 device. You just latch it onto the side of a pot you already own, plug it in, and get cooking. The touchscreen interface is a little annoying to wrangle (and unnecessary for such a simple device) but otherwise it works like a charm. I don’t own a Vitamix, and I love my immersion blender as much as the next guy, but even if my tiny kitchen had room for all the fancy gadgets I covet, my favorite kitchen gear would still be a simple knife. OK, maybe not a simple knife, a good knife. More specifically, a Global Knife. A good knife is hard to find, especially if you’re a twentysomething rifling around a utensil drawer while cooking in your friend’s apartment. There’s nothing more unpleasant than trying to slice and dice with a subpar knife. Which is why, if you’re going to invest in any kitchen gear, you should make it simple, and sharp. I have a small kitchen, so when my family members give me culinary Christmas gifts, they try to choose space savers. In truth, my set of nesting bowls and measuring cups, rather like the one above, doesn’t save that much space—standard measuring cups are relatively compact. But there is something so aesthetically pleasing about bowls and cups that fit together like nesting dolls. If there is a neat freak in your life who likes things to be just so, he or she will appreciate the feeling that all is right in the world when all nine items in this set are nested perfectly together. No single tool has changed my kitchen life like the immersion blender. I used to dread and beg off making puréed soups—so much work for so paltry a result! Chopping, roasting, letting cool, transferring, taking the blender down, putting it back up. A mess made and sink piled high just for a few measly slurps, followed by hungry looks. No more. I can now blend the cucumbers or squash in the original pot, and be done in seconds. I can snap off the attachment and run it under the faucet. And I can do it all while feeling the thrumming, lightly weaponized joy I always imagined jackhammer operators feel. Would a thermos by any other name keep coffee so hot? Maybe, but this is the only one a family friend, my “Uncle” Larry, a grizzled (and seemingly part-grizzly) Korean War vet, would have at camp kitchens in the Rockies. I walked by the iconic Stanley at Costco for more than a year before pulling the trigger, and in the months since, it’s become my prize possession. Use this variant of the Dewar flask as a flask for Dewar’s, or to keep drinks piping or freezing for far longer than your typical travel mug. The lid doubles as a cup, and the whole thing, like a Maglite, doubles as a giant stainless-steel torpedo to launch at any intruders in your kitchen, be it set in an 18-wheeler, the mountains, or your office. Like a lot of apartment cooks, I’m wary of adding special contraptions to my limited cabinet space, which explains why I denied myself the pleasures of a mandoline for so long. Wasted time! I’ve lived with this lovely machine for only a little over a month so far, but I’ve already noticed an expansion in my cooking imagination. Dishes like pommes Anna and French onion soup have become weeknight fare when before the prospect of that much slicing would have soured my appetite. Sure, I could have used a food processor disc, but the hands-on control of the mandoline is so much better. Speaking of hands, you definitely need to watch them with this device, but a little caution is rewarded with piles of perfectly sliced edibles—a fair trade in my opinion. The smartest gadget in my kitchen uses 19th-century, Amish-approved technology. You just suction-cup the apple peeler-corer-slicer to your countertop, stick an apple into the tines, and turn the crank as one blade peels the apple, a second slices it into a perfect spiral, and a third pops out the core. It’s ridiculously fast—you can prepare a dozen apples in the time it would take to slice one by hand—and the device makes a satisfyingly juicy swooshing sound. This sponge will change your life. Well, it’s not really a sponge, more like a spaghetti-like cleaning revolution that you use in place of the traditional grimy microbe-laden dish sponges. First of all, it works so much better than a regular sponge for scrubbing, without scratching anything. Also, it dries out completely between uses so you are never “cleaning” your dishes with a soggy and stained pile of grossness. Also, you normally need to replace a sponge every few weeks before it gets too dirty. These scrubbers last for months and are no worse for the wear. I have given this scrubber as gifts to people and they’ve gotten rave reviews. Whether mopping up a spill or drying a plate, this towel is everything a sidekick should be: supple, no-nonsense, superabsorbent. It is also delightfully colorful, soft to touch, and fun to wave out the window at your admirers/neighbors like a medieval lady as you do the dishes. There are no other things I use in our kitchen more than this sheet pan and its accompanying wire rack. I have four of each. They are perfect: oven-sized, sturdy, restaurant-grade, utilitarian, and great for cooking basically everything. I make cookies on them and roast vegetables on them. I dry beef jerky on them and soak cedar planks in them. If I could legally marry a pan and wasn’t already married to a wonderful human (or if pan/human polygamy was made legal) this would be the one. Correction, Dec. 16, 2013: This article originally misspelled Santoku, the Japanese knife brand.